A diverse representation of religious groups, scholars, and attorneys for advocacy groups on the left and right met under the auspices of The American Assembly March 23-26, 2000 in New York to formulate a consensus on religion in America’s public life. Wayne Jacobsen, President of BridgeBuilders, served as a discussion leader and part of the drafting team for the Assembly. The American Assembly, an affiliate of Columbia University, was founded by President Dwight D. Eisenhower in 1950 “to illuminate issues of public policy.” The Assembly convenes authorities from relevant constituencies on critical national issues, both domestic and foreign, to reach the highest possible consensus and to distribute their recommendations to 20,000 decision-makers at all levels of Federal and state government. This was the 96th meeting of the Assembly and the first to cover religious issues. Every local school district should work with parents and community leaders to develop clear religious liberty policies on student religious expression that reflect the new consensus under current law. Local school districts should work with parents and community leaders to articulate clear religious liberty policies for students and school personnel that reflect the new consensus under current law. 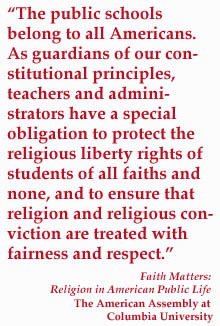 School leaders should provide in-service opportunities for teachers and administrators focused on First Amendment principles and legal guidelines for implementing religious liberty policies. Colleges and universities should reform their curriculums to ensure that administrators and teachers are prepared to address issues concerning religious liberty and diversity in public schools and to teach about religion in their respective subjects whenever appropriate. Responsible citizens should encourage teaching about the role of religion in American schools, public and private, from elementary through university. The complete document, Faith Matters: Religion in American Public Life, and a list of the participants can be found at the American Assembly web site. These recommendations would go a long ways to disarming the kind of conflict that disrupts communities and paralyzes local school districts.